If you take a weekly injection of interferon, you owe thanks to a chemist. This is because without the chemistry of pegylation you would need to inject interferon up to three times a week. In short, pegylation makes taking your medicine easier and actually makes it work better. Pegylated interferon, usually called peginterferon, is a chemically modified form of the standard interferon that treats hepatitis C and rarely hepatitis B. The difference between interferon and peginterferon is the PEG, which stands for a molecule called polyethylene glycol. The PEG does nothing to fight the virus. But by attaching it to the interferon (which does fight the virus), the interferon will stay in the body (specifically the blood) much longer. This process benefits hepatitis patients taking interferon because rather than needing to inject interferon up to three times a week, only one weekly injection is needed. In addition, it yields a higher rate of sustained virologic response. 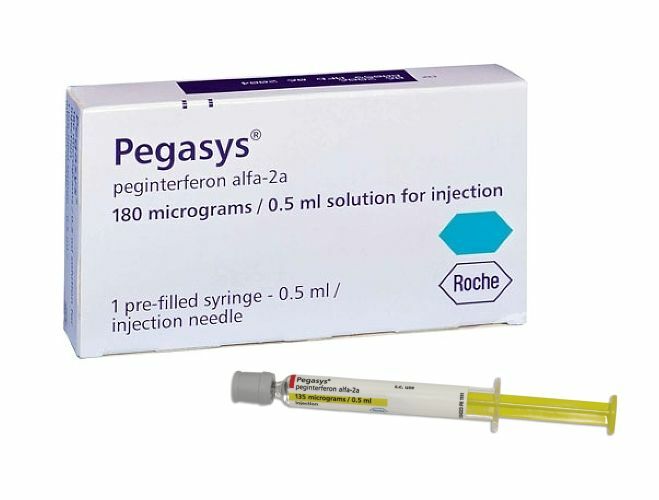 There are two versions of peginterferon, which are marketed individually as Pegasys (also known as peginterferon alfa-2a) and PegIntron (also known as peginterferon alfa-2b). Both have similar pharmacokinetic actions, with only minor differences between the two. Prior to the introduction of direct-acting antivirals (DAAs) in 2013—which include the drugs Sovaldi, Harvoni, Daklinza, and Viekira Pak, among others—the most effective way to treat hepatitis C was with a combination of peginterferon and ribavirin. The dual therapy is known to have a high level of treatment side effects, some of which can be profound. Still, the combination therapy was able to achieve a sustained virologic response (the clinical definition of a cure) in about 50 percent of cases. Today, with the newer class DAAs, the use of peginterferon has fallen away significantly, although it is sometimes still prescribed in cases of advanced liver disease and/or in patients who have had previously failed therapy. Peginterferon is injected once weekly. The exact dose will vary based on a number of factors, including the genotype of your virus, the type of peginterferon you’ll be using, and the accompanying drug(s) it will be co-administered with. Your nurse will teach you how to correctly administer the injection, usually subcutaneously (beneath the skin). Peginterferon must always be refrigerated, and needles must never be reused or share. Patients on treatment will often speak of Riba Rage, a condition typified by general irritability and sudden, sometimes explosive emotional outbursts. While the term suggests the cause is ribavirin, it is more commonly associated with peginterferon. Antidepressants are sometimes prescribed to treat the condition, particularly in patients with pre-existing psychiatric issues. A full course of peginterferon treatment is expensive but luckily, with newer class DAAs, the duration of treatment is far shorter than before. Medicaid, Medicare and private insurance will generally cover the cost of interferon when hepatitis C treatment is approved. Co-pay assistance can be sought through the drug manufacturer for qualified patients, as well as a patient assistance programs (PAPs) for uninsured or low-income patients. Always be sure that your doctor has your complete medical history, including information about any other chronic infections you may have (e.g., HIV, diabetes) or any plans you may have to conceive. Katzung, BG. Basic and Clinical Pharmacology, 10e. New York, McGraw-Hill, 2007. Brenner GM, Stevens, CW. Pharmacology, 2e. Philadelphia, Saunders Elsevier, 2006.
Genentech. "Pegasys: Highlights of Prescribing Information." Merck. "PegIntron: Highlights of Prescribing Information." How Do Peginterferon Alfa 2a and 2b Treat Viral Hepatitis?